Archives - FRIENDS OF HISTORIC NACOGDOCHES, INC.
On May 3 & 4, 2014, FoHNI in cooperation with the City of Nacogdoches Historic Sites Department hosted a series of walking tours through Oak Grove Cemetery. This historic cemetery is the resting place of many notable Texans as well as every day individuals whose lives represent the past. Guides will led attendees through a six-stop tour. At each location a living history interpreter in historic attire spoke about "his" or "her" life. On Saturday, May 3rd, tours began at 10:00 and started every 15 minutes until 1:00, the last tour. On Sunday, May 4th, tours began at 1:30 and started every 15 minutes until 3:30, the last tour. Tickets are $10.00 per person. Children under 10 years of age are free, but they must be accompanied by an adult. Please, no pets. First come, first served. Oak Grove Cemetery is located along North Lanana Street, in between Park and Main Streets. Please follow posted parking placards and respect no parking zones. A shuttle will be available for those who park at the Sterne-Hoya House and in the parking lot on East Main and Mound. 2015 - This year's Living History of Oak Grove Cemetery tour was Saturday, March 28th with tours beginning at 10:00 a.m. and the last tour started at 1:15 p.m. We had almost 100 people from Texas, Louisiana, Indiana, and elsewhere enjoy the spirits come to life in Oak Grove. The weather was beautiful and so if you missed this year, please plan to attend next year! On May 4, 2013, FoHNI in cooperation with the City of Nacogdoches Historic Sites Department hosted a series of walking tours through Oak Grove Cemetery. This historic cemetery is the resting place of many notable Texans as well as every day individuals whose lives represent the past. Guides lead attendees through an eight-stop tour. At each location a living history interpreter in historic attire spoke about "his" or "her" life. Tours began at 1:00 and started every 15 minutes until 3:00, the last tour. Tickets were $10.00 per person. Children under 10 years of age are free, but they must be accompanied by an adult. First come, first served. Oak Grove Cemetery is located along North Lanana Street, in between Park and Main Streets. The first annual Tour of Gardens was on March 16, 2013, FoHNI in cooperation with the Nacogdoches CVB. This was a one-day tour of area gardens which functioned as FoHNI's second major annual fundraiser. The tours are wonderful opportunities to visit local gardens as they bloom in all their spring beauty. Tickets are available for purchase at the Visitors Center on the square for at least two weeks prior to the event. Please note, FoHNI will no longer be hosting this event. It will now be an activity of the recently formed Garden Society as it works to promote Nacogdoches as Texas's Garden Capital. We wish them the best of luck and can't wait to enjoy the tour ourselves! The second annual Tour of Gardens was March 22, 2014, FoHNI in cooperation with the Nacogdoches CVB. This was a one-day tour of private gardens and is FoHNI's second major annual fundraiser. The tours are wonderful opportunities to visit local gardens as they bloom in all their spring beauty. The following private gardens were on tour in 2014. We would like to thank all of the property owners who did everything possible to have blooms despite the cold weather! The 2013 Tour of Homes was Sat., December 14th. The tickets were on sale at the Nacogdoches Visitors' Center on the square at 200 E. Main Street. Tickets cost $15.00 per person and were valid from 1:00-5:00 p.m. for all six properties: The Heard Home (CBH Insurance Agency) at 108 E. Hospital - park and enter in the back, The Fleming House at 1226 Ferguson Street, The Ammons Home at 612 East Oak Lane, The Rudisill Home at 821 North Street - parking is available across the street, The Hall Home, 1102 Millard Drive, and the McDonald Home at 1204 Millard Drive. Click below to download the flyer & map. Thank you for your support - despite the cold winter of 2013 we had a great turnout! The 2012 "Christmas Inspirations" Tour of Homes was Sat., December 8th. This year's event was December 8th from 1:00-5:00 p.m. Tickets were available at the CVB for $15.00 per person. ﻿The s﻿ix properties on this year's tour were in or near downtown. The properties included the law offices of Clardy, Davis & Knowless, the historic chapel at the Sacred Heart Catholic Church, the Brick House and other homes. The 2011 Tour of Homes was Saturday, December 10th. This year's tour theme was Country Estates. The tour included the homes of Wesley and Linda Morgan, Dr. Arthur and Deanna Speck, James and Anne Lewis, and the historic Old North Church shown below. (Photographs by Perky Beisel) We had an excellent turnout with over 300 people attending on a beautiful winter afternoon. This house was designed by Diedrich Rulfs in 1899 for Tolbert B. Hardeman. It is located in the Washington Square District which at that time, was on the north edge of town. The spacious 4,800 square foot home features double columns on pedestals, half double galleries and dental molding over the windows. The house has been home to eight different families. Chappell and Mary Elizabeth Jordan purchased the house for their home in 1995. This Victorian house was designed by architect Diedrich Rulfs in 1897 for Stephen William Blount and wife Mary Price Blount. Branch Patton bought the house for a funeral home on the death of Mary in 1945. Pam & Lyle Thorsten bought it in the 1980s and repaired damage from the removal of a large chapel built on the north side in the 1950s. The house is built of heart pine. Three couples bought and worked on it during the 1990s, again making many changes to the interior and exterior. Bob & Jo bought it in 2010 and began extensive renovations including a wrap-around porch with a handicap ramp on the NW side, arched windows from the chapel, refinished floors and period trim. The homeowners have worked for 3 1/2 years to complete the renovations. Designed in 1900 by renowned German Architect Diedrich Rulfs, this charming Victorian home is located in the historical Washington Square District. The Keller home has remained within the same family since its purchase by K.P and Flouie Branch in 1913. This delightful two story residence retains many of its original features, including woodwork, flooring, high ceilings, light fixtures and three fireplaces. Many of the original family’s antiques and paintings can be found throughout the home. The Mayer & Schmidt clothing store was located in the building from the 1900s-1920s. It was advertised as the “Largest Department Store in Nacogdoches since 1878”. The original Mayer & Schmidt building burned in 1908 and owners commissioned Diedrich Rulfs to build the current structure, which he completed by 1909. (The entire block burned in 1908 with a fire that started in the Davidson Building. An arsonist caused the fire.) The building was sold to the Mast family in 1938. In 1986, the building was used for the Recreation Center for the City of Nacogdoches. Today, it houses lawyer offices and apartments. Located on Hob Knob Hill, this 1990 traditional county cottage is a “country in the city” home. Sit on the front porch in one of the 1915 hand-carved rockers and enjoy the beautifully landscaped yard. Gather around one of the fireplaces inside and view the antiques, English-style furnishings, hardwood floors and interesting old door hardware. And finally, stroll along the granite paths to enjoy the extensive back gardens and watch the horses frolicking in the pasture below. This 1970s era home was extensively remodeled in 2000 with the addition of a sunroom, utility room , master closet, den, pantry and raised ceilings. The home is now a comfortable showcase for an art collection featuring works by local artists Gary Parker, Robert Kinsell and Jeff Brewer. The sunroom doubles as a teaching practice laboratory for the owner JR Ornelas, drummer and band leader of the Nac Pac Jazz Trio. Interior design of the home is by owner, Jill Ornelas with Ambiance. 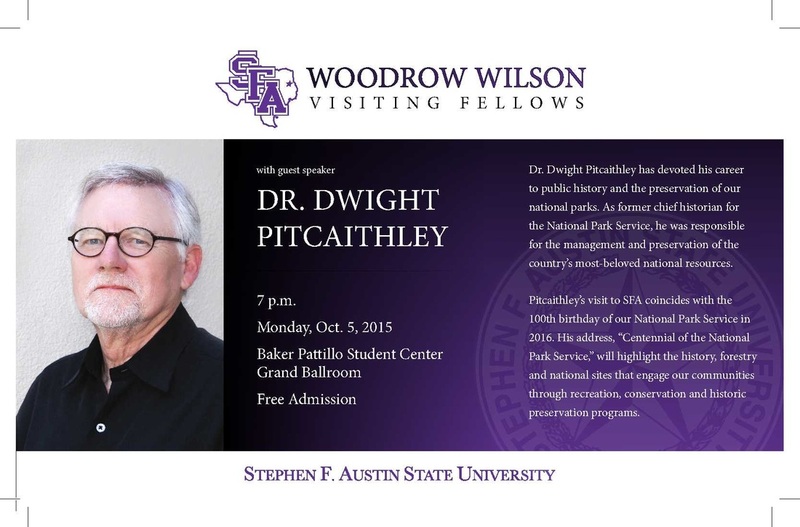 Due to the generosity of the Woodrow Wilson Visiting Fellow program, SFASU is hosting Dr. Dwight Pitcaithley the week of October 5th. There will be a series of events for students, faculty, and the public and we hope that you will be able to attend these. Pitcaithley had a long career with the National Park Service which culminated in his appointment as the Chief Historian. As such, he was involved in many projects such as the restoration of Ellis Island and the Statue of Liberty and the movement to provide updated research and interpretive materials at national parks across the country, but especially at Civil War sites. We hope that you will be able to attend the public lecture or some of the other events.